Yesterday was Columbus Day and I have to proclaim it as one of our most minor holidays, right down there with Arbor Day, Flag Day, and maybe just a little less prominent than Groundhog Day. I was tempted to post an anti Columbus rant yesterday, but out of respect for Italian-Americans I decided to delay until at least the holiday was over. Why would I care if we honor Columbus and set aside a special day to recognize his place in our history? What wrong with that? First, Columbus didn’t actually discover America. The Vikings had already voyaged here long before he made it. So my first objection is that we’ve all been taught a lie, and that lie is being perpetuated to this day in our schools. Secondly, and more importantly, there were millions of people living full and vibrant lives on this continent when Columbus “discovered” it. The ancestors of these inhabitants were the real discoverers, and the first people to set their feet on American soil. Thirdly, where’s their holiday? Is there any holiday which recognizes Native Americans? Why not? Is their contribution to our heritage less than that of one plucky Italian sailor? I don’t think so. Fourthly, there’s a dark side to Columbus Day. What Columbus actually accomplished was to set in motion a genocide of native peoples by European intruders. I’ve taken some blowback for a previous blog about Thanksgiving in which I pointed out that the Pilgrims and other early settlers ruthlessly slaughtered tribes in Massachusetts Colony, another little shameful anecdote from American history we’d rather ignore. Fifthly, Columbus himself was not above killing native peoples. Maybe this is a truth Americans would prefer not to hear, but Columbus and his men raped, murdered and took as slaves the natives they encountered. Do we really want to honor and continue to tell school children what a great person he was? Does anybody care about all this? Not very much. The descendants of what was left of the original occupiers of this continent have been so marginalized and so overwhelmed by European bloodlines, we seem to rarely ever consider their point of view. Which seems a little weird. I thought our country had developed some appreciation for the value of diversity in our culture. The fight for minorities to be included in the American experience has become a foundation of political correctness. Except for one group, which hardly ever seems to get any recognition. Native Americans still live in abject poverty, confined by economic reality to some of the worst pieces of land the government could find. There are no prominent Native American politicians, few celebrities, almost no wealthy tycoons among them. In fact, they are practically invisible in American culture. We live in a country where Johnny Depp can portray a Native American in a Disney movie and hardly anyone seems to care. European descendants have no problem adorning their bodies with beautiful jewelry inspired and often actually created by native people, while turning their back on the plight of these people in our society. Let me ask you this. What other minority group has to suffer a professional sports team whose name is a racial slur? Answer, none. That situation would not be tolerated by our culture. But the Washington Redskins will be cheered on once again this weekend by adoring fans. This is an ugly truth we need to fix. We need to stop worshipping false heroes and admit our role as mass murderers. At the least, a minor holiday should mark the people who first inhabited this country. Call it Crazy Horse Day, or Sequoyah Day, or Geronimo Day, but for the sake of all that’s right, let’s do something. Part of our heritage in the United States is that some of the country’s founders were religious zealots who came here seeking freedom from oppression. But even though groups like the pilgrims had suffered under intolerance, they themselves were intolerant, apparently immune to the very history they had lived. Today, over 300 years later, Americans still live with the heritage of forced Christian dogma, though officially there is supposed to be a separation of church and state, Christian ideas still have an impact in our everyday lives. The government is supposed to represent all Americans, but if you’re atheist, agnostic, Moslem, Buddhist, Hindu, Shinto, Wicca, or a bunch of other beliefs, the government is still in your face with Christian doctrine. It’s right there on our money: In God We Trust. I thought we were supposed to be a nation that celebrated diversity. Can you imagine the furor that would rage if the Treasury Department decided to celebrate diversity by putting on some coins and bills In No God We Trust, for the 5 percent of Americans who says they are atheists? Maybe it could say In Yahweh We Trust for our five million Jewish citizens, or In Allah We Trust for our seven million Moslem citizens. In Allah We Trust? Can you imagine the uproar? Only Christianity gets to propagandize with government backing. Isn’t that favoritism, plain and simple? Why not just eliminate all references to God on all our money? 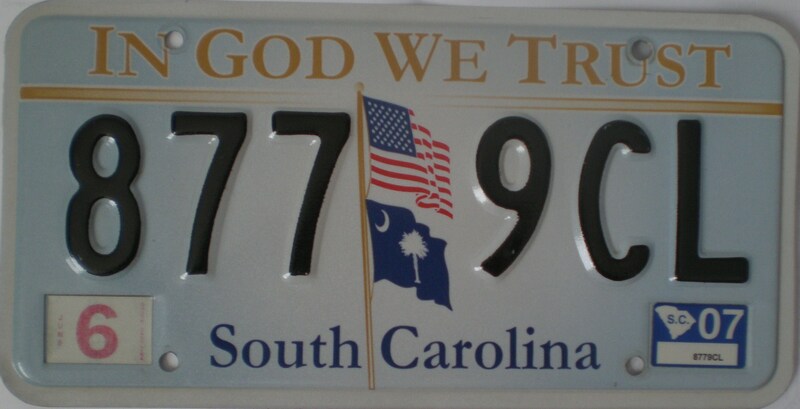 Some states offer a license plate that bears the motto In God We Trust. There are no license plates offered for non-Christian faiths. Christians might want to argue that God is a reference to a supreme being across all faiths. But that argument doesn’t hold up. Different faiths have different names for their deities. God is the name of the deity of Christians. The gods (notice even our capitalization rules are prejudiced) of other faiths go by many names, The Great Spirit, Zeus, Thor, Buddha, Satan, and many, many more, none of which appear on American money. There are 12,000 non-Christian congregations in the United States. None of them use the name God. Atheists, of course, believe in no God. They’re citizens too. Why should their money bear this deist credo? Agnostics just aren’t sure. Why should they be forced to face the assertion that they trust in the Christian divinity? I mean who is this “We” in In God We Trust. School children, no matter what their faith, are asked to recite the pledge of allegiance, including the phrase “one nation under God.” Our elected officials, from the President down, never make a speech without mentioning God. Where I live, you can’t buy beer, wine or liquor on Sunday. Why? Because it’s the Christian Sabbath, codified into local ordinances. The phrase In God We Trust wasn’t on our money until 1864, and the “under God” in the pledge only dates back to 1955. I’d like to make one thing clear. I’m not condemning Christians for their beliefs. One of the great things about our country is that everyone has the right to their own religious ideas. It was one of the rights that was established by the founding fathers in the Constitution. But if you’re a Christian, shouldn’t you be embarrassed to have your beliefs thrust constantly into the face of non-believers? Didn’t Jesus say something about loving even your enemies? If Christians believe in compassion, why not show tolerance for all Americans by taking their God out of the equation? Some readers will see this issue as silly, unimportant, and think anyone who objects to these God references could just ignore them. But if this issue is so trivial, why not just resolve it by eliminating these references? The United States is rapidly becoming a rainbow of cultures. There was a time in our history when we were overwhelmingly a Christian nation. It’s just not that way anymore. Only 20 percent of Americans attend church on any given Sunday. Do the math. Four times as many abstain from religious services every week. It’s time our government got out of the religion business, not part way, not most of the way, not 99 percent of the way. It’s time for a true division between religion and government.